Since discovering Seche Vite last year, I rarely apply nail polish without a top coat. I've a tendency to apply my polish right before bed or right as I'm about to decide I need the loo and I need something fast drying and that makes my nails look shiny. I've been playing around with these two top coats from Sally Hansen and decided to give you the 411 on them. 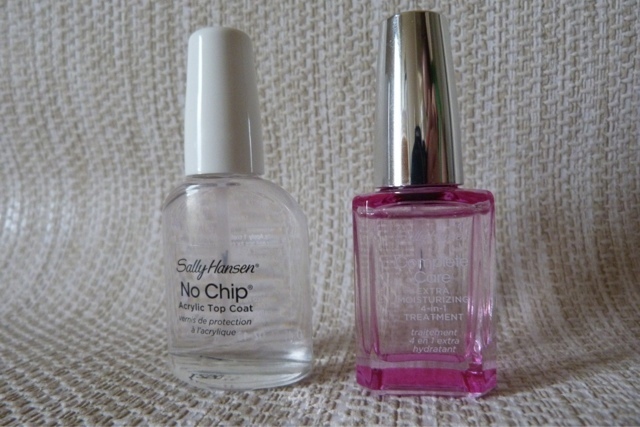 Let's start with the most recent addition to Casa Girlie Bits; Sally Hansen No Chip Acrylic Top Coat (€5.75). It looked thick like my Seche Vite and that got me excited, as much as a top coat can get one excited. Promising to seal my nail colour to a smooth, hard, high gloss finish, I got stuck in and on it went. It dried really quickly, I'll give it that and although it wasn't the uber smooth finish I get with Seche Vite, I was really happy with how it looked and felt. I have a weird tendency to stroke my nails like I'm Mr. Burns, I know. Weirdo. I went to work happy as Larry with my purple sparklicious nails and at about breakfast time, that's when the fun ended. I developed big cracks across my nails. Nearly all of them were afflicted with the crackage and I knew it was only a matter of time before this happened. This was at lunch time. I didn't pick anything off or peel any polish off even though it's all I wanted to do. No, I took a picture and had a little moment with my nails. If you click on the photo you should be able to see the cracks in my baby finger and my thumb. These weren't just tip wear issues, no, big crater cracks. Ah well, what can you do. Not for me sadly as I'd such high hopes. However Sally Hansen has not left us without a great top coat. Their Complete Care 4 in 1 treatment (€10.95) is a brilliant top coat along with being a base coat, strengthener and growth activator. At nearly double the price of the Acrylic Top Coat, it's a much better investment and I've found myself reaching for it over my Seche Vite. Where has Seche Vite has a tendency to chip after a couple of days, I can get a good 5 days out of my polish with just tip wear using the Complete Care treatment. It leaves my nails lovely and glossy and although it doesn't leave as smooth a finish as I'm used to or dry as quickly as the Acrylic Top Coat, it finishes off my manicure beautifully and I know I can rely on it to stay put. Since using it my nails have become stronger and I nearly have them back to normal now and I credit the moisturising complex with that. I would totally recommend Sally Hansen's Complete Care 4 in 1 if you're looking for a Ronseal type of product, does exactly what it says on the tin and let's be honest, who goes out and actively buys a base coat and uses it? This takes the hassle out of it as most of us use a top coat! Have you tried these top coats? What's your favourite one? 5 days? I don't think I've ever had polish last more than 2 days! Must try this out myself and see how long it lasts! Even with the SV I only get a couple of days!! I buy base coats! Love the 4-in-1 except for how long it takes to dry - I always end up smudging it if I use it on top of polish. Jesus, those are some big cracks! I'd love to try the 4-in-1 but can't find it anywhere, have looked in about five different Boots stores but nada! Five days without chipping you say? Deadly.Defo gonna get a bottle of the 4 in 1 (looks down at poor stumpy chipped nails:( !! I'm just home from "actively" going to the chemist for base coat..No nail polish gets near my nails without a base! Not that bothered over top coats as regardless what I do/use,my nails smudge 5 minutes after doing them..
Let's face it, using third party money in general can hurt a monthly budget. The funds are provided at the borrowers home instantly to meet the urgent and unexpected issues. it's a good idea to find out exactly what the SBA is looking for.